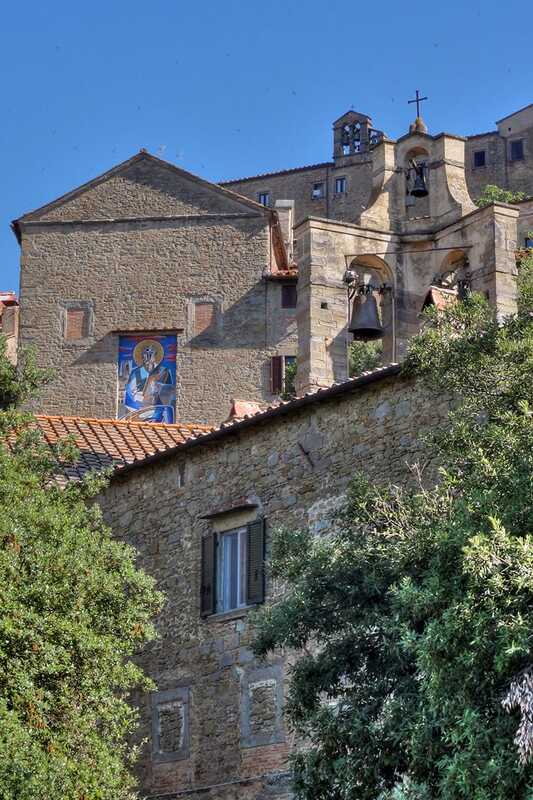 We simply have to look at the number of bell towers and architectural jewels all around the town of Cortona to immediately have an idea of the deep spirituality of this territory which many saints and beatified persons came from leaving important evidence of their passage. 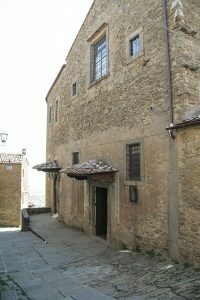 In the late 1800s there were over 800 priests, friars and nuns in Cortona: this number gives an idea of how many convents and churches were active! 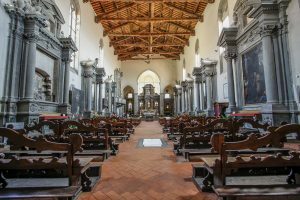 The churches open to the public are still many and there is something for everyone: Romanesque and Gothic; cloistered monasteries, collegiate churches and sanctuaries; medieval convents and oratories. So let’s go on a journey to discover the spirituality of this place. The majestic cathedral of Cortona underwent several variations over the centuries: directly built over the ruins of the old parish church of Santa Maria, consequently adapted by Nicola or Giovanni Pisano, it was originally the mother church of the Terziere of Santa Maria, then, fully renovated in 1507, it became the new cathedral of Cortona dedicated to Our Lady of the Assumption. The internal space, modified a few times, is divided into three parts, a central nave and two side aisles, with frescoed ceilings dating back to the second half of the 19th century. Among the works of art over the side altars and within the choir we find: the Nativity by Pietro da Cortona and his pupils (around 1650); a Virgin Mary with Saints Filippo Neri and Margaret and Beati Guido and Ugolino by Lorenzo Berrettini (Cortona, 1620-1672) placed over an altar that preserves an ossuary with the bones of Beato Guido Vagnottelli, a Franciscan friar; within the choir the Virgin’s Girdle attributed to Cristoforo Allori; two paintings made by Signorelli’s pupils, Saint Thomas touches Jesus’ ribs and Crucifix; the Descent of the Holy Spirit by Tommaso Bernabei known as Il Papacello, the Consecration of the Basilica of the Savior by Andrea Commodi (1603) and the Virgin Mary of Rosary with Saints by Cigoli (1597). Built between 1245 and 1247 on a design made by Brother Elias, it was originally a convent for the Order of Friars Minor within the city walls (in addition to the existing convent of Le Celle); a church was then constructed next to it to be the biggest and most beautiful church of the town, the only example of Gothic church in Cortona with a single nave, timber roof truss and three cross-vaulted apse chapels on the sides. Over the centuries this church underwent several modifications, however its original structure is still untouched; the 14th-century frescoes in the church were removed in the first half of the 17th century to make room for new stone altars, so today only a few fresco pieces remain on the walls. Among the altarpieces we find the Immaculate Conception with Saint Christopher and Saint Catherine by Andrea Commodi (1609); Saint Anthony and the miracle of the mule by Ludovico Cardi known as Il Cigoli (1597); the Nativity by Raffaello Vanni; the Annunciation by Pietro Berrettini (1669). The Franciscan relics preserved in this church are priceless: the Reliquary of the Saint Cross brought back from the Holy Land by Brother Elias, Saint Francis’ funeral cushion and the tunic worn by the saint when he died, left as a gift to the church by Brother Elias. A huge convent, partly still in place, was annexed to the church although it is no more used as a convent. Built from 1230, after several renovation and refurbishment works over the centuries, this complex consisting of a church and a convent was finally completed during the 15th century. 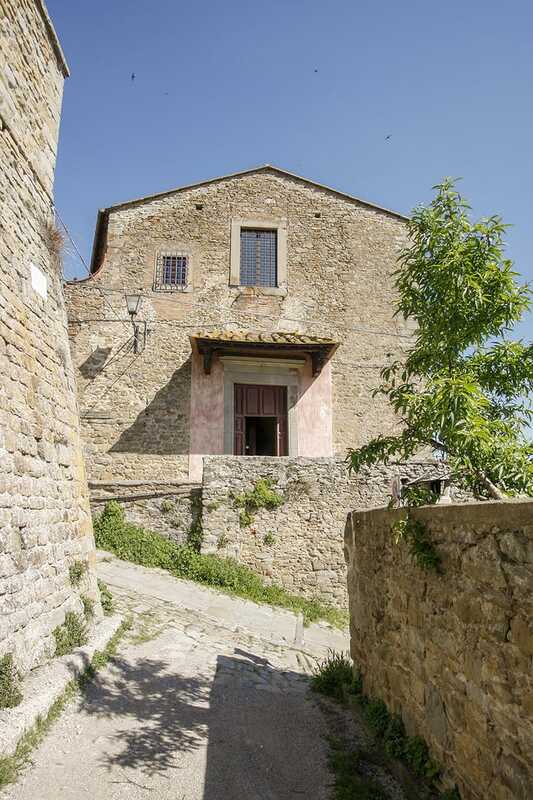 The church has a simple and harmonious facade with a frescoed lunette by Fra Angelico representing the Virgin Mary and the Child between Saint Dominic and Saint Peter martyr and the four Evangelists made in 1433-34. The internal space has a single nave, notwithstanding the subsequent variations and the addition of side altars during the 17th century, and preserves its original beauty given by the apse chapel arches, by the raised chancel and the wonderful ceiling with timber roof truss. 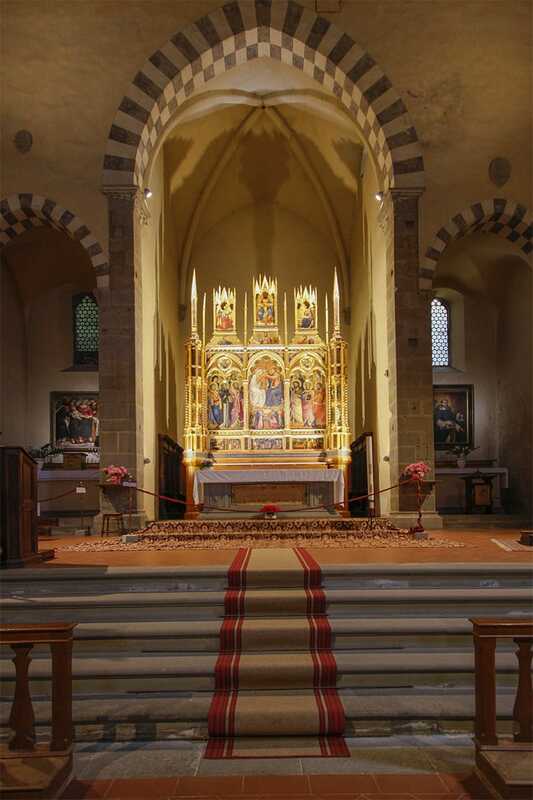 Over the main altar there is a magnificent polyptych by Lorenzo di Niccolò, donated by Cosimo and Lorenzo de Medici to the Dominican friars in 1440. Underneath the main altar the corpse of Beato Pietro Capucci is preserved. Among the works of art displayed in this church we find the Virgin Mary with Saint Dominic, Saint Augustine, two angels and Giovanni Sernini (Bishop of Cortona who commissioned this painting) by Luca Signorelli in the apse chapel on the left; The dispute of Saint Catherine of Alexandria (1603) by Andrea Commodi; the Circumcision of Jesus Christ (1598) by Domenico Crespi known as Il Passignano (1560-1636); the Our Lady of the Assumption with Saint Hyacinth and Dominican Saints by Giacomo Palma The Younger (Venice 1544-1628). Small parts of 16th century frescoes were also restored, among which we can see the figures of Saint Roch attributed to Bartolomeo della Gatta and Saint Augustine by Marcillat. This convent was demolished for the most part in the mid 1800s. Constructed in 1273, the original Gothic church was smaller than the current building. The existing part and the subsequent extensions of this complex are clearly visible on the facade. Where the current gate is located there are traces of the Gothic gate that was bricked up and then replaced with new openings. 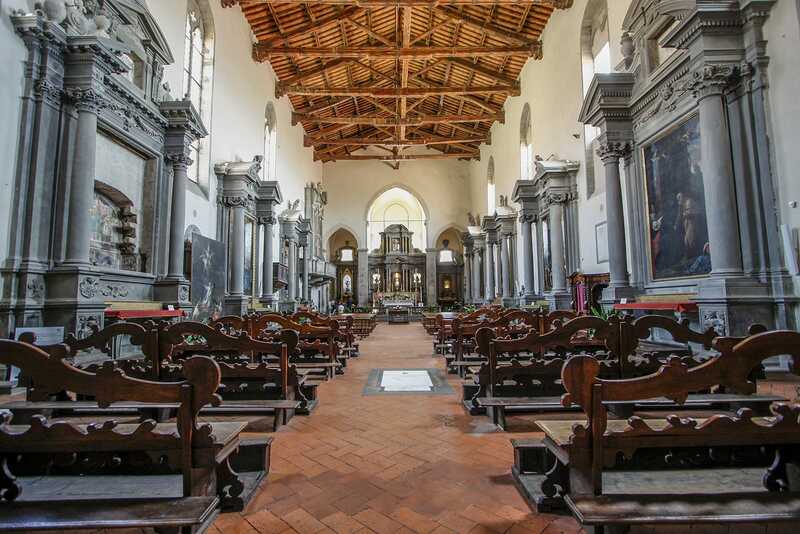 The church is no longer used for religious rituals and Baroque altars, four on each side, and three apse chapels were added to the original internal structure with single nave. 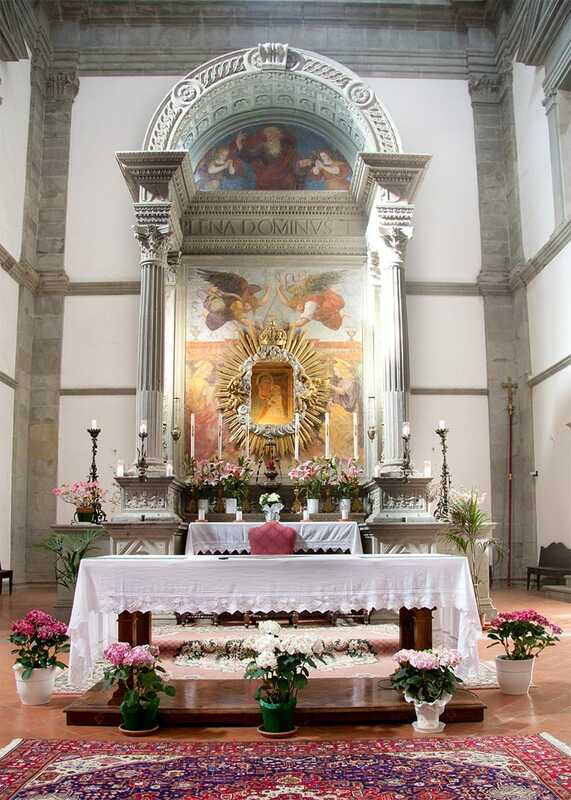 The canvas painted by Berrettini representing the Madonna enthroned with Saint James The Greater, John The Baptist, Saint Stephen and Saint Francis was hung in the left-hand chapel and today is displayed in the MAEC Museum. 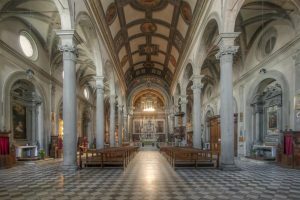 The Church also preserved the corpse of Beato Ugolino Zefferini, a worshiped Augustinian Friar from Cortona, whose remains have been moved to the Church of San Filippo Neri. Next to the church we find the former convent of Augustinian Friars, which is now used as conference center: the internal cloister can be visited. 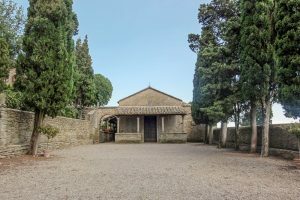 The small church of San Benedetto is a little jewel at the very heart of this neighborhood. The building, with an elliptic ground plan, was built by the Piarists in 1722, after the demolition of the old church of rectangular shape, as shown in the plan drawn by Berrettini in 1634; the current church was reconstructed in a scenic location to perfectly match the surrounding buildings, as clearly evidenced by the staircase designed by architect Tuscher (1705-1751). 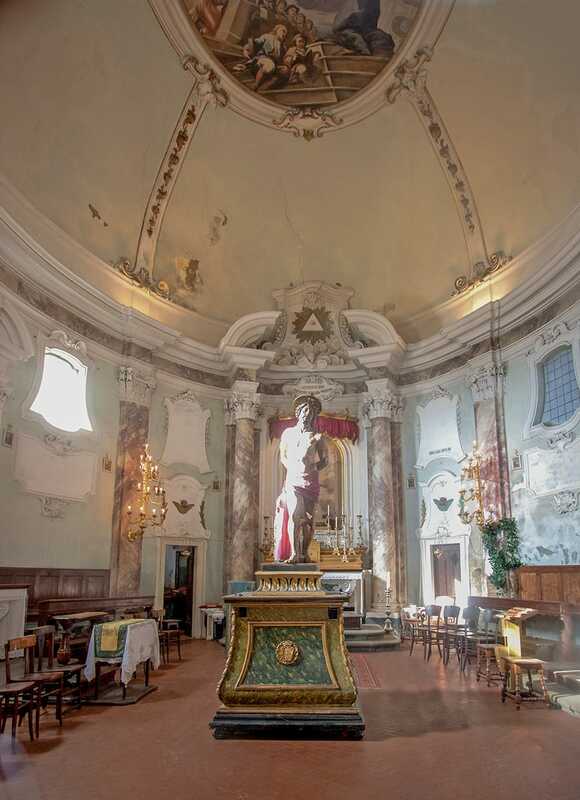 This is the last church to have been built in Cortona, after several vicissitudes, upon the design made by Don Antonio Jannelli, who managed to have it completed in 1720. 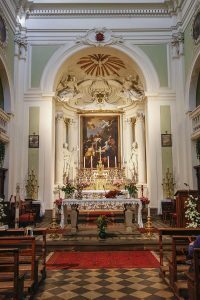 The church has a Latin-cross structure and a remarkable height, whose global harmony is given by the soft color of walls and by rich but sober and elegant ornamental stucco works. 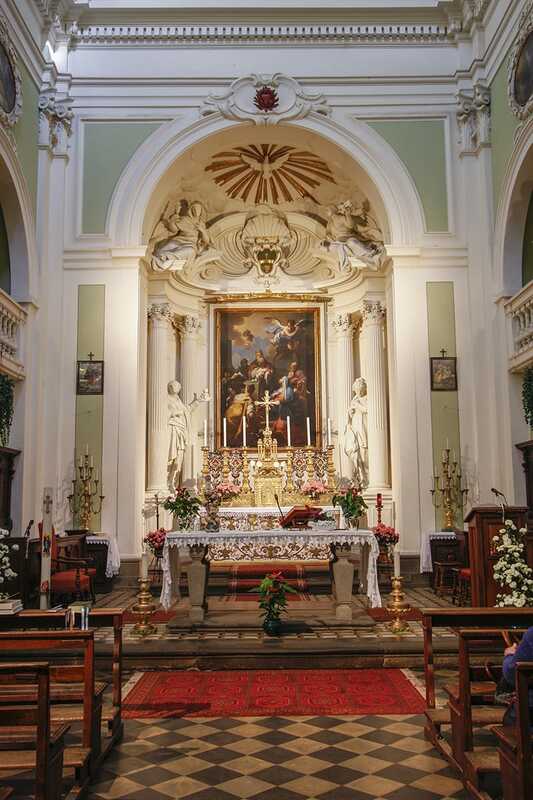 Over the main altar there is a Presentation at the Temple by Camillo Sacrestani and over the altar on the left there is the famous Virgin Mary and the Child with Saint Andrew, John and Joseph by Giovanni Battista Piazzetta (1683-1754). The remains of Beato Ugolino Zefferini were moved here from the Church of Sant’Agostino to be worshiped. The imposing pipe organ in the counter-facade, recently restored and brought back to its original splendor, was made by Antonio Felice Parlicini (1668-1741?) from Florence. Once left Porta San Vincenzo on the left, at the bottom of the downhill street, we find the Church of Spirito Santo also called Church of the Visitation of the Holy Mary. 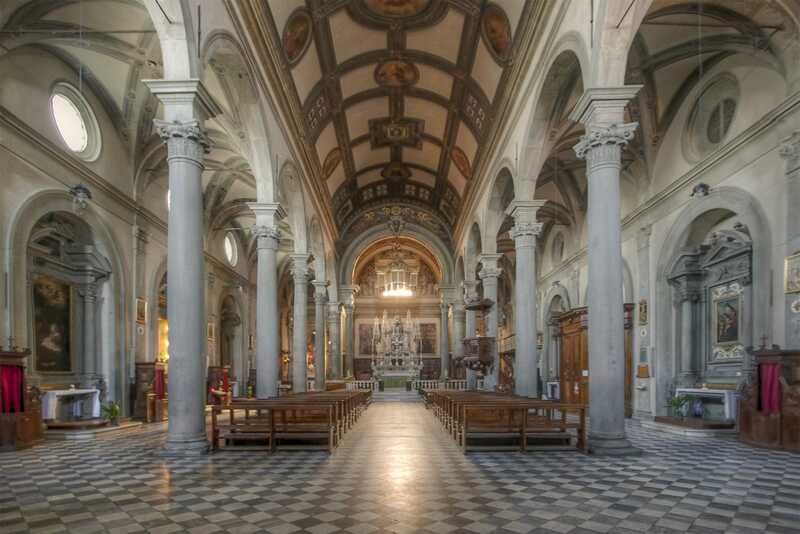 Built in the 17th century from a drawing by Filippo Berrettini on a worshiped aedicule famous for its healing power, this church is more Renaissance than Baroque in style. The internal Latin-cross structure preserves a marvelous canvas by Giuseppe Angeli, a well-known pupil of Piazzetta, representing a Madonna enthroned with Saint Felix of Cantalice and Saint Margaret of Cortona. This church is usually closed to the public. Probably built on an existing church, in 1440 it was chosen as seat of the oratory of the Compagnia Laicale di S. Niccolò, which operated until 1782 and was then abolished by Bishop Alessandri in agreement with Peter Leopold; the Compagnia was reestablished in 1952 and now it actively operates in maintaining the church and in keeping it open to visitors. The church layout embellished by a porch with original Corinthian columns on the facade, a porch on the left-hand side and an elegant belfry with three bells dates back to the 15th century. The church has a single nave and maintained its original appearance although it underwent several modifications between the 17th and and the 18th century. The church preserves the famous procession standard by Luca Signorelli, painted on both sides: the Deposition from the Cross on the front side and the Virgin Mary and the Child with Saints on the back. The fresco on the left-hand wall representing the Virgin Mary and the Child with Saints is attributed to Signorelli or to his pupils. 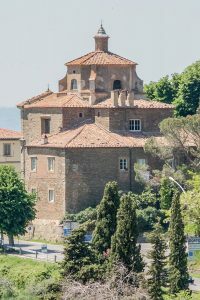 In the mid 1500s Giorgio Vasari designed this imposing monastery, which was then built in the 17th century on existing Etruscan-Roman and medieval ruins by Luca Berrettini. Today it is still in operation and is run by a large group of cloistered nuns. In the small church of the monastery, open to the public, there is a beautiful canvas over the altar on the left representing the Deposition from the Cross, which was recently attributed to Pietro Berrettini known as Il Cortona (1625); over the altar on the right there is an Immaculate Conception by Andrea Commodi whereas a Virgin Mary and the Child with Saint Francis and Saint Clare by Lorenzo Berrettini is displayed in the lunette over the main altar. Opposite the Monastery of Poor Clares we find the other important cloistered monastery of Cortona, the Monastery of the Santissima Trinità, which hosts Cistercian Benedictine nuns since 1545; in 1349 there were already an oratory, a small church and a hospital for the pilgrims of the Compagnia laicale dei Disciplinati, then of the Holy Trinity. 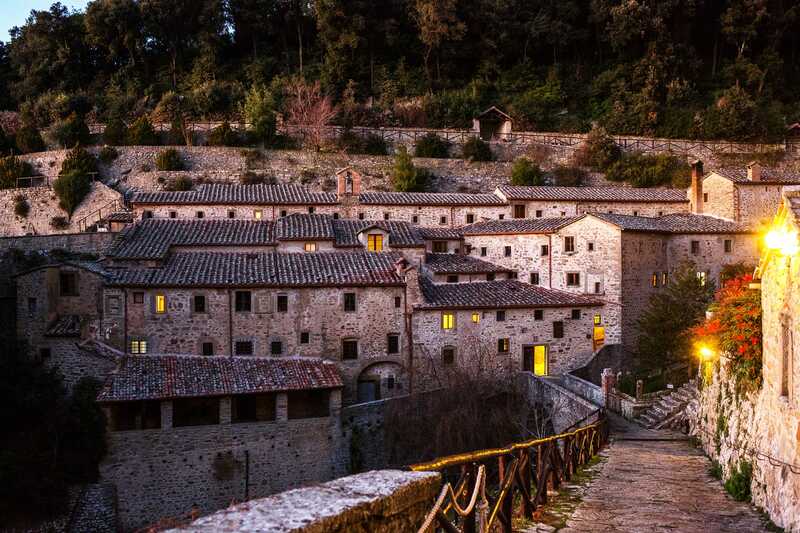 The corpse of Veronica Laparelli from Cortona is preserved in this monastery. 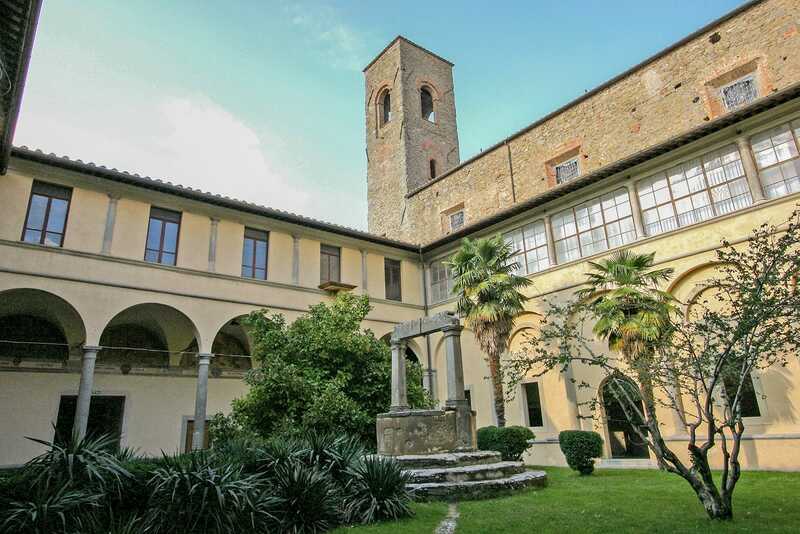 The Convent of S. Caterina is adjacent to the monastery so that the seats of the most important monastic orders are physically and spiritually located one next to the other: Franciscan Poor Clares in the Monastery of S. Chiara, Cistercian in the Monastery of Santissima Trinità and Cloistered Canon of Saint Augustine in the Convent of S. Caterina, which is separated from the Monastery of the Trinità by a narrow street. 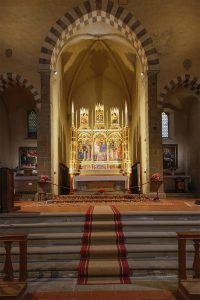 The small church of the monastery is open to the public; over the main altar there is a canvas representing the Holy Trinity and the Child made by the pupils of Andrea del Sarto. On the right-hand wall there is a representation of Our Lady of the Assumption with Saint Diego, Benedict and Scolastica by Baccio Bonetti (1558). 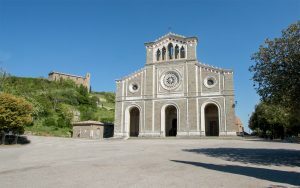 This sanctuary, dedicated to the patron saint of Cortona, has been completely reconstructed in Roman-Gothic style between 1856 and 1897 and there is nothing left from the original structure of the 14th century except the central rose window on the main facade. Inside the Basilica, over the main altar, the intact corpse of the patron saint of Cortona is on display lying within a precious silver case made from the drawing of Pietro Berrettini in 1646. On the left-hand side of the chancel there is a marble cenotaph by Gano di Fazio in Gothic style. Over the right-hand altar of the chancel there is the famous and worshiped Timber Crucifix, a valuable work of art dating back to the second half of the 13th century. The altars on the sides of the nave date back to the 17th century; among the most interesting works of art on display we find a canvas by Francesco Vanni representing God The Father, the Immaculate Conception and Saints Francis, Dominic, Louis of Toulouse and Margaret of Cortona of 1602; this is the first representation of Margaret as Blessed person (we remind you that she was canonized only in 1728). A votive chapel in memory of the victims of the First World War, painted by Osvaldo Bignami in 1917, is located on the left aisle. Walking down Via Santa Margherita, you find the lower entrance of the Church of San Marco, showing a shining mosaic by Gino Severini on its facade representing Saint Mark, patron saint of Cortona. The main facade on Via Maffei dates back to the 16th century and bears a Baroque gate and a frame of the 15th century; it opens into the upper church, whereas the lower gate on Via S. Margherita opens into the lower oratory. Over the right-hand altar of the main church there is a painting representing Saint Charles Borromeo praying for the end of the plague by Andrea Commodi of Florence, a work commissioned to him by the Compagnia for the altar and made approximately in 1614; a small antiquarium of sacred objects is now visible next to the lower oratory. In addition to the wide range of churches in town, there are many other beautiful parish churches, abbeys, collegiate churches and Marian sanctuaries in the surroundings: these buildings are all valuable and remarkable from the architectural and artistic points of view. Leaving Porta Colonia behind and following the old road leading to Hermitage Le Celle, we see the Church of S. Maria Nuova: its construction started in 1550 from a drawing by Cristoforo Infregliati, known as Il Cristofanello, and continued according to the design by Giorgio Vasari; then in 1738 it became a renowned Collegiate Church. The church, elegantly rising up, has three identical facades; the rectory and other annexes are backed against the fourth side. The church has a perfect square ground plan, whose four load-bearing pillars supporting the dome give a Latin-cross appearance to the structure; four small chapels on the corners give a certain harmony to the whole building. Some masterpieces of the 17th century are displayed within the chapels such as the Birth of the Virgin by Alessandro Allori (1595), the Annunciation by Jacopo Chimenti known as L’Empoli (1614) and Saint Charles Borromeo giving communion to plague victims by Baccio Ciarpi (1614-15). The main marble altar, made by Mariotto Radi of Cortona, preserves a fresco representing the Virgin Mary with the Child known as Ellera, thought to have miraculous powers. 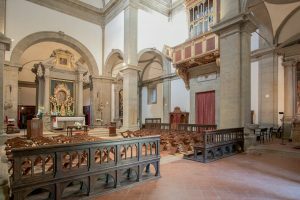 Within the choir, a canvas representing Saint Margaret in Ecstasy by Lanfranco was displayed in the chapel Vanuti and is now preserved in the Palatine Gallery in Florence; in its place there was a similar canvas by Giuseppe Maria Crespi, now preserved in the Diocesan Museum. Only a part of the church can be visited. 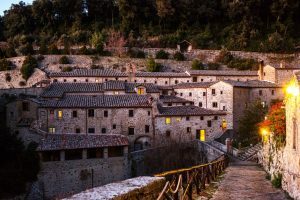 In the immediate surroundings of the town, about three km from Cortona, Franciscan Hermitage Le Celle is beautifully set on the mountain foot in a natural cleft full of spirituality and fascination; the original core was founded by Saint Francis of Assisi in 1211 and is still inhabited by Capuchin Friars and is a not-to-be-missed destination for both pilgrims and tourists. 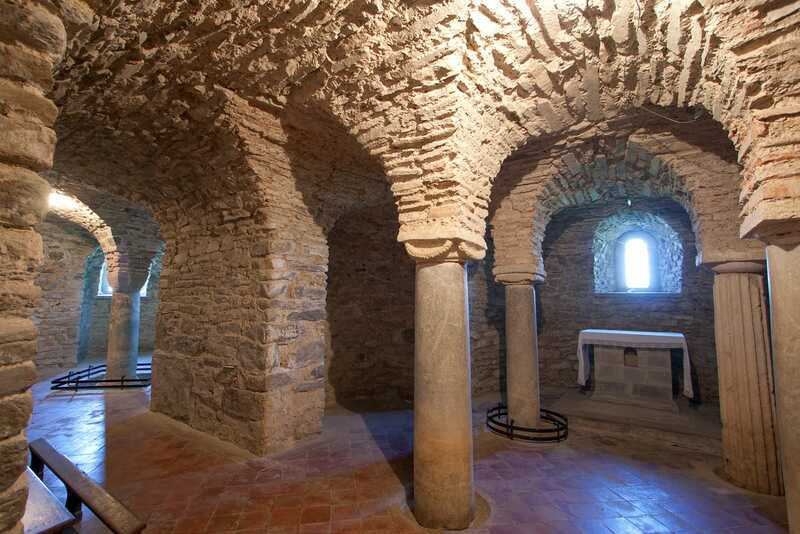 Inside the convent the Cellar of Saint Francis, a tiny room where Francis stayed in 1226 when he was ill, is still visible. This church is located on the opposite hillside as compared to the Church of Santa Maria Nuova and is considered one of the “perfect works” of the Renaissance. In this place at the end of the 15th century there was a leather tannery (from where the name Calcinaio derives); because of miraculous events due to a sacred image of the worshiped Madonna, in 1485 famous architect Francesco di Giorgio Martini was commissioned the construction of a temple in honor of the Virgin: the result was this marvelous Latin-cross church topped with an octagonal dome; the proportions and architectural and ornamental features give an impression of lightness and elegance notwithstanding its size. The facade gate was made by Bernardino Covatti; in the lunette over the gate there is a Madonna with Saints made by an anonymous artist from Umbria in the 16th century. The stained-glass rose window was made by Guglielmo Marcillat. The church was completed in 1513. The inside of the church, with a single nave, is quite bright and harmonious; the chapels, created within the wall depths, the brightness of the huge dome, the layout of grey frames on the walls enhance the sense of harmony and space. The main altar made by Covatti preserves the miraculous image of the Virgin which inspired the construction of this church. Among the works of art displayed inside the church we find a group of paintings by Tommaso Bernabei known as Il Papacello: Immaculate Conception, Annunciation, Adoration of The Magi and Assumption. In the cross-vault on the right we can also admire a Madonna and Saint Elisabeth with Jesus and Young Saint John The Baptist by Alessandro Allori and a Madonna Enthroned and the Child with Saints John The Evangelist, Thomas of Canterbury, Roch and John The Baptist by Jacone. Since 1985 this church was proclaimed Marian sanctuary. Masses are regularly celebrated and the church can be visited. 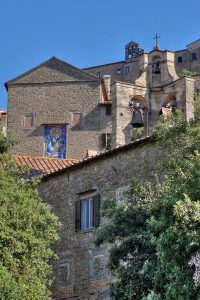 At the entrance of the Val d’Esse, in the village of Metelliano, there is an old church dedicated to Saint Michael The Archangel. Situated along the old Roman road that linked the Val d’Esse valley and Cortona with the Valtiberina valley and Umbria and also the extremities of the Germanic Via Romea, this church dates back to the 11th century and has a simple facade typical of Romanesque churches with little columns and capitals and two narrow windows; the apse area is richer with three apses separated by pilaster strips constructed with reclaimed Roman materials. The two side gates are really impressive with monolithic lintels adorned with low relief decorations. The internal longitudinal structure is divided into a nave and two aisles finished by semicircular apses. The nave and the aisles are separated with an alternated pattern of pillars and little columns. The timber roof truss has a system of barrel vaults before the apse area. Several fragments of sculptures, mostly dating back to the early 9th century and found during refurbishment works carried out in 1905 and in 1961, are on display inside the church. About 15 kw away from Cortona, we find a Benedictine abbey dedicated to Saint Mary that was built in the 10th century (today only the apses and the crypt remain of the original structure and as tradition goes this church was built on a pagan temple); however, the number of significant transformations made over time have totally affected the original layout of the church; therefore it is not clear if it had a basilica plan or rather a single nave. It is absolutely certain that in 1755-59 the facade and part of the monastery buildings were demolished, whereas at the end of the 18th century the nave was shortened. Inside the church the magnificent transept dating back to the 10th century and the three apses, which originally had a trilobed design and a barrel vaulted ceiling, stand out for their beauty. 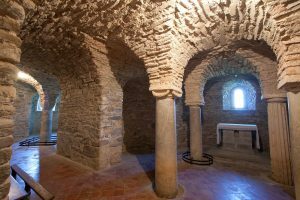 The interesting crypt dates back to the 10th century for the most part, although it was recently classified as an example of Carolingian gallery architecture and thus dated to the 11th century.